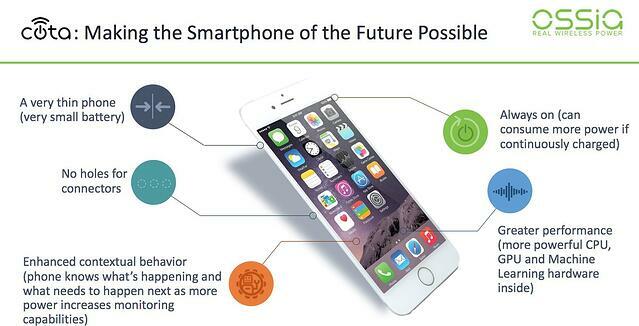 How Will the Smartphone Evolve Next? A smaller-sized power source. A thin device is a lightweight and versatile device. To evolve the smartphone, it needs either an extremely thin battery or power source, without sacrificing function. Real wireless power provides that. No holes. Power ports and headphone jacks are size-limiters, introduce peripheral compatibility requirements, and open the phone for dust and moisture intrusion. Real wireless power does not require wires or plugs; therefore, no holes. No down time. A truly efficient phone is always on and powered up. The current system of charging and recharging requires downtime, whether it’s tethered to a cord or a pad. And a waning battery compromises function. A wirelessly powered phone is continuously charged and operating at its full potential, even at a distance. Always. More power. As the smartphone capabilities’ increase, the phone needs more power to monitor, inform, and perform effectively, especially while multiple functions happen concurrently. Wireless power provides enhanced contextual behavior abilities. Greater performance. More powerful CPUs, GPUs, and machine learning built in mobile devices means improved performance overall. Performance enhancing technology requires continuous power that real wireless power can provide. Which Wireless Power Fulfills All Five Requirements? Cota Real Wireless Power is the next step in enabling the mobile ecosystem to work even smarter. The mobile ecosystem is made up of many kinds of companies and consumers, working together to make mobile devices smarter, more efficient, and more valuable. How are consumers a part of the ecosystem? By being early adopters of new technology, by speaking up about what is working and not working, and by contributing ideas and solutions to problems. Consumers, with their behaviors, push the ecosystem in directions that best work for them. And companies? It’s not just Apple and Android. It’s Original Equipment Manufacturers (OEMs), device designers, technologists, inventors, component manufacturers, and service providers that are pushing forward with innovations, consistent guidelines, delivery, and support that make the ecosystem thrive. Both consumers and companies are talking about how evolving mobile devices beyond our current imagination depends on real wireless power. How will you contribute to the making the mobile ecosystem flourish in the future? Contact Ossia about how licensing Cota can empower the future of your mobile products.